This post is a tribute to Bernd Rosemeyer, the first man to break the 10 minute barrier around the Nürburgring Nordschleife. A feat he accomplished during the 1937 Eifel Race. Next Wednesday, 14 October, marks the 100th anniversary of Rosemeyer’s birth. Rosemeyer is acknowledged as one of the finest drivers of his era. 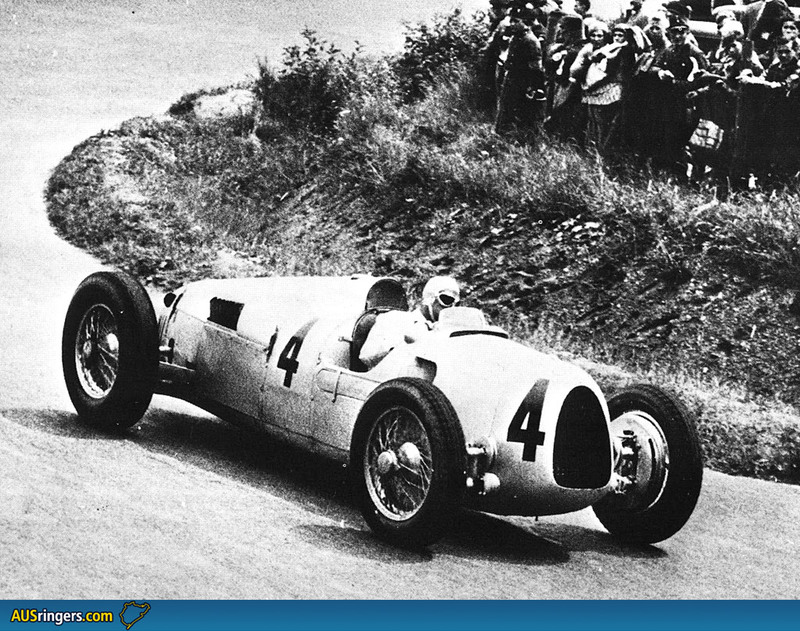 He won the 1936 German Grand Prix, driving the Auto Union Type C you see above. Tragically, Rosemeyer was killed on 28 January 1938 while attempting a world speed record at the wheel of an Auto Union Streamliner on the Autobahn between Frankfurt and Darmstadt. As a mark of respect, Audi will be honouring Rosemeyer’s anniversary by placing a wreath near his memorial on the A5 Autobahn. Racing footage of Rosemeyer in action during the 1930s can be viewed after the jump. The 100th anniversary of the birth of racing driver Bernd Rosemeyer, who was born on October 14, 1909 in Lingen in north-west Germany, is approaching. Audi Tradition will be laying a bouquet at the memorial on today’s A5 Autobahn. Rosemeyer achieved international fame primarily as one of Auto Union’s top drivers in Grand Prix races and world speed record attempts in the “Silver Arrows” era of the 1930s. His racing triumphs in Europe, Africa and the USA made him a public idol – not least because of his swashbuckling driving style. Bernd Rosemeyer was a hero of his time, who tragically lost his life at the zenith of his career while making a world speed record attempt in early 1938. 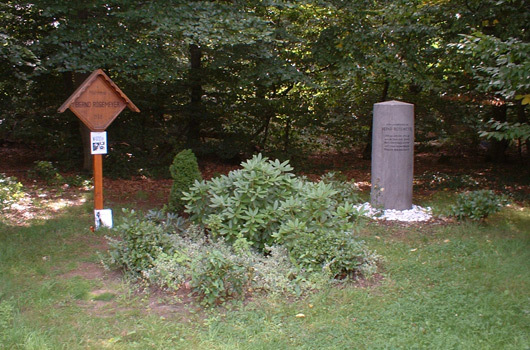 Bernd Rosemeyer started his career by participating in motorbike races on grass tracks and on the road. He signed up as a works driver at NSU in 1932 before switching to DKW in the following year. In October 1934, he passed a test for up-and-coming drivers in Auto Union’s challenging mid-engined racing car with flying colours. He was then immediately promoted to the company’s racing car team alongside Hans Stuck and Achille Varzi. And thus his meteoric rise in the motor-racing universe began. Following his debut in the Auto Union Silver Arrow in the 1935 AVUS Race, he quickly attracted attention in the Eifel Race in particular, when he finished second, just behind ex-champion and racing legend Rudolf Caracciola. And then on September 25, 1935, Rosemeyer went one better, winning his first Grand Prix in Brno. In the following year, the triumphs came thick and fast: he won the Grand Prix of Germany, Switzerland and Italy, as well as the Großer Bergpreis hill-climb race. 1936 was also the year in which he won the hand of the renowned sports pilot Elly Beinhorn in marriage. In the 1937 season, Rosemeyer achieved some true milestones in motorsport: in the Eifel Race at the Nürburgring, with a time of 9 minutes and 54 seconds, he was the first driver ever to complete a lap of the legendary North Loop in less than 10 minutes. 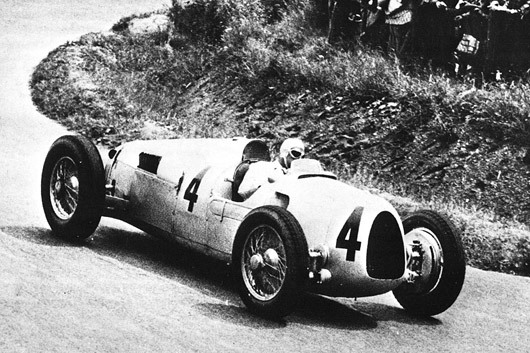 In the Avus Race, at the wheel of the streamlined Auto Union Type C, he achieved a straight-line speed of 380 km/h for which he is still famed today. In the world speed record attempts on the motorway near Frankfurt, he was the first driver to break through the 400 km/h barrier on a public road. His last victory was in the Grand Prix of Donington on October 2, 1937. A renewed attempt to break the world speed record on January 28, 1938 on the motorway between Frankfurt and Darmstadt (today the A5) ended in tragedy when the car skidded out of control at over 430 km/h. 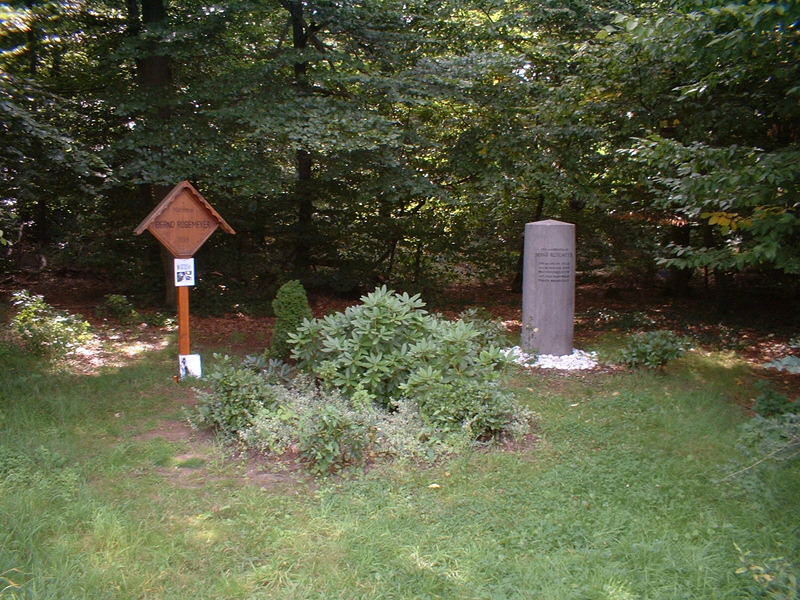 The ensuing accident cost Bernd Rosemeyer his life. Thank you for this tribute to the great Rosemeyer and for the amazing video. I had no idea that one could see these old race videos. I have CMC models of the AU W125 1937Type C and of the Streamliner.